If a picture says more than a thousand words, then the picture should have a maximum expressiveness, right?! In times when photos are becoming more and more important (see Instagram), being able to take good photos is increasingly part of a good style, and thus part of your personal competence profile. But why are some photos better than others? How do professional photographers get great photos? Well, first of all, professional photographers don’t just take a picture! You don’t just point the camera at the subject and quickly touch the shutter release button. Professionals have learned to see what is different from mere vision. They use their brains just like their eyes. They have studied what other photographers and visual artists have done over time. Have you ever thought about how you take your pictures? Probably not, because most of us do this in automatic mode – both in the camera or in the smartphone as well as our own, spontaneous automatic vision. 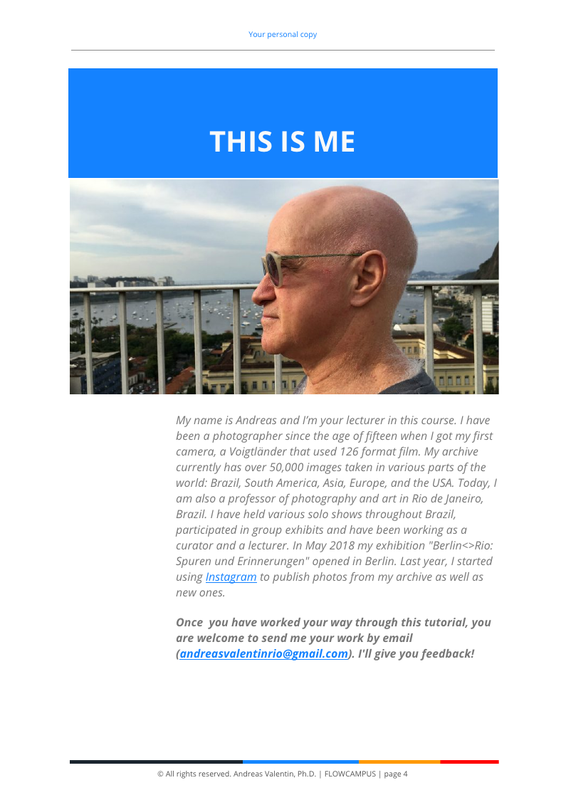 If you not only want to take photos but also consciously make photos, use our online course „One-hour photo“, which we have now released as a DIGITAL MAGAZIN TO GO for mobile training. 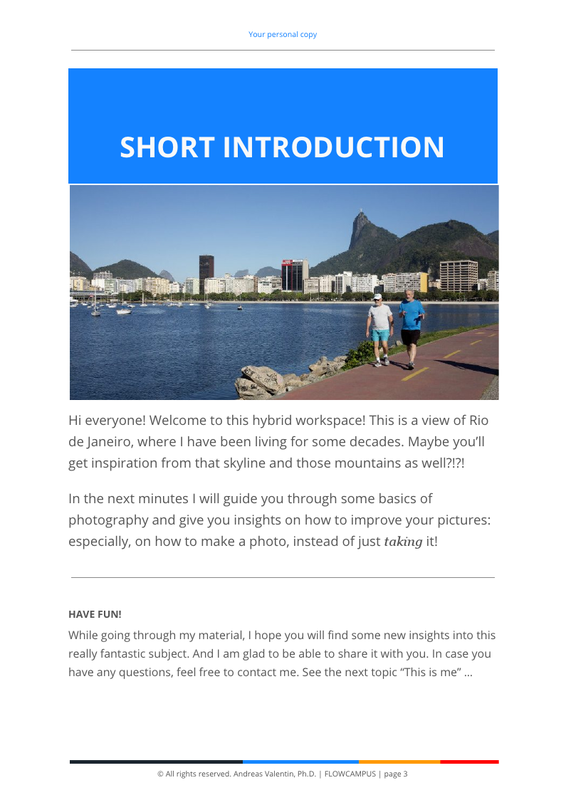 We have asked photography professor, curator, and artist Andreas Valentin (Ph.D.), who teaches in Rio de Janeiro, to prepare his know-how so that amateurs can learn the basics of photography in a (first) lesson. A real leap in competence building should be possible. You can find Andreas on Instagram at@andreasvalentin and on the Internet at www.andreasvalentin.com. 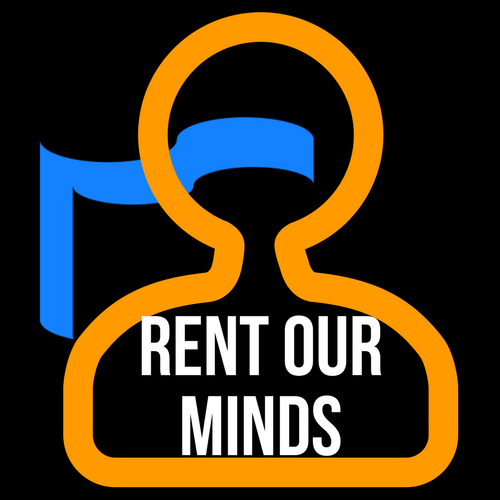 We have now made the intro video publicly available. Please watch the video on YouTube – thanx GDPR! 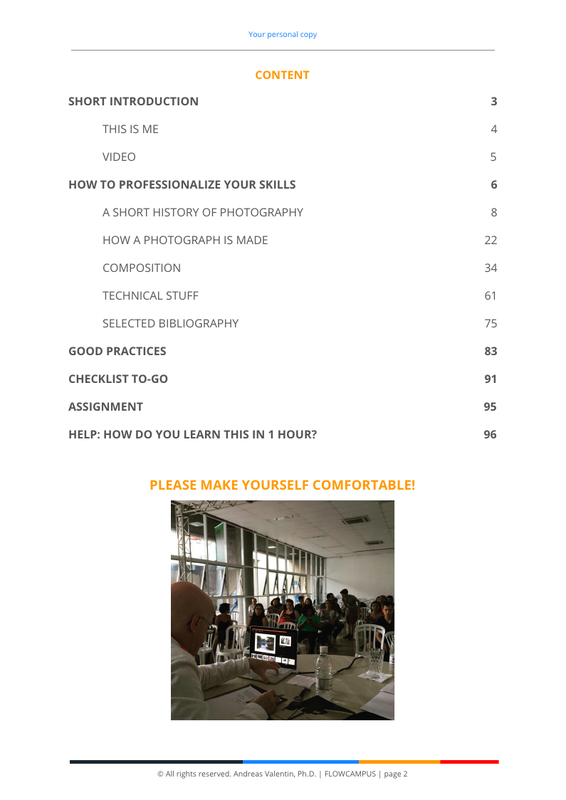 ONE-HOUR PHOTO: TAKING OR MAKING PHOTOGRAPHS? You can buy the DIGITAL MAGAZINE now. Besides all the valuable information and experience you will receive a qualitative feedback from Andreas when you have sent him your result of the task. You can start reading immediately! 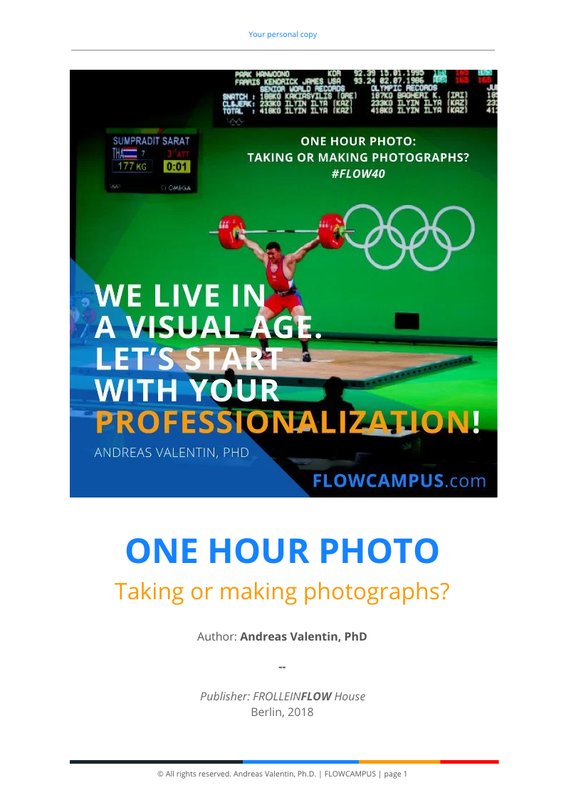 >> ONE HOUR PHOTO: Taking or making photographs? 99 pages with texts, photos, videos + feedback by Andreas Valentin, Ph.D.
Now for 97 47 Euro (VAT excluded). If you have a FLOWCAMPUS voucher, you can redeem it here.